PHARMACEUTICALS AND HEALTHCARE: PV era begins?! PV (or pharmacovigilance) era is stuttering to a start and is looking to stay forever in India. 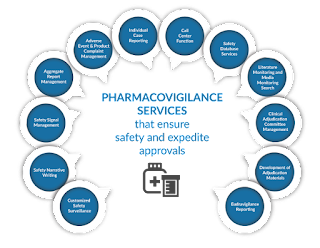 As per WHO, PV (pharmacovigilance or drug safety) is 'the science and activities relating to the detection, assessment, understanding and prevention (DAUP) of adverse effects or any other drug-related problem'. The above interesting image from here. Union Health Ministry has issued pharmacovigilance (PV) guidelines to be implemented by MARKETING AUTHORISATION HOLDERS (MAHs). The guidelines are issued in Oct 2017 and Govt of India has given 6 months time for its implementation by the MAHs. Govt of India has released the PV guidelines in form of a pdf document for Marketing Authorisation Holders (MAHs) (Manufacturer and/or importer of drug) of Pharmaceutical Products in India. The pharma company is expected to meet the PV legal requirements thru' complete in-house department or have arrangement with PV specialist CROs (CRO = Contract Research Organization) or mix of two with clear demarcations in responsibilities. Each pharma company shall have a PvMF (Pharmacovigilance Master File) located in India, which shall document the PV system for all the marketed products. Now as per Schedule Y of the Drugs and Cosmetics Act, 1945 each pharma company ie., MAH shall appoint a trained PvOI (Pharmacovigilance Officer-In-Charge) who will be responsible for collection and processing of AEs/ADRs following administration of drugs...the PvOI shall be a medical officer or pharmacist trained in collection and analysis of ADR reports. (Veterinary products and Medical Devices are excluded). PV structure should be clearly defined...the departmental responsibilities and CRO responsibilities should be clearly demarcated in case of PV CRO arrangement. The pdf also gives details on PV activity required for pediatric and geriatric usage of products. PV concept is now a legal requirement and the UCPMP (Uniform Code of Pharmaceutical Marketing Practices) is also on the anvil of becoming a law...both these will have a mega impact on pharma marketing activities (PCD or propaganda and distribution companies and small pharma marketers/manufacturers will feel the impact significantly). NEVER A DULL DAY IN PHARMA FIELD!! Please scroll down to read all other posts, and kindly do recommend this blog to your colleagues.